The Midsummer Fire Festival celebrates the summer solstice, which takes place this year on the 21th of June at 05:04 GMT. The solstice also marks the beginning of the summer season in the western culture. The event takes place throughout Azeroth and players will mostly be visiting settlements to honor bonfires of their faction and desecrate bonfires of the opposite faction. Daily quests and Ahune (the event boss) are also on the menu. In 2017, a number of things were added. Please check Stan's Midsummer Festival changes for more information. During the Midsummer Festival, you will spend the vast majority of your time traveling through Azeroth to visit bonfires and honor/desecrate them (depending on whether the bonfire belongs to your faction or to the opposite faction). In addition, you will probably have to do daily quests for a few days in order to gather enough tokens to buy the last rewards you need. Finally, you get to kill Ahune, the boss of the event. You can farm him for a pet and item level 480 loot. The Midsummer Fire Festival is a 2-week event that will run, in 2017, from June the 21st to July the 5th. If you want to buy all the rewards and obtain all the achievements, it will take you two years of doing the event as you cannot obtain enough tokens in a single year (though you can do all the achievements). If you are not interested in vanity items, then the tokens you will obtain on the first day will be enough to get all the achievements and the pet reward (although you might want to try your luck at killing Ahune once a day for the second pet reward). The event starts in any of the capital cities, where you will find the main quest givers: Festival Loremaster and Master Flame Eater for Alliance and Festival Talespinner and Master Fire Eater for Horde. The reward vendors are also located in capital cities: Midsummer Supplier (Alliance) and Midsummer Merchant (Horde). As said in the introduction, you will also spend the vast majority of your time traveling through the settlements of Azeroth to honor/desecrate bonfires. The currency of the event is Burning Blossoms. It is used to buy the rewards from the vendors. On the first day, you can earn approximately 900 Burning Blossoms, mostly by honoring/desecrating bonfires, something that you can only do once. On subsequent days, you can earn approximately 30 Burning Blossoms by doing the 3 daily quests and by killing Ahune. Note: we used the adverb approximately twice in the last two paragraphs. The reason for this is that when you kill Ahune for the first time on a given day, you receive a varying number of Burning Blossoms (10 on average). You need 1,460 Burning Blossoms to buy all the rewards and obtain all the achievements. The pets and the gear are the only rewards that will appeal to almost everyone. The rest of the rewards are clothing items, food, and vanity items, some of are needed to complete achievements. Captured Flame, Blazing Cindercrawler, and Igneous Flameling are sold by the event vendors and cost 350 Burning Blossoms. Frigid Frostling is taught by using an Ice Chip. This item has a chance to be contained in a Satchel of Chilled Goods, which you obtain when you kill Ahune for the first time on a given day. There are 4 toys you can buy from the event vendors: Brazier of Dancing Flames, Burning Defender's Medallion, Cozy Bonfire, and Set of Matches. The first 2 cost 350 Burning Blossoms and the last 2 cost costs 500 Burning Blossoms.. Weathered Heirloom Armor Casing for 600 350 Burning Blossoms. All the gear drops from Ahune, the boss of the event. For more information, check out our dedicated section. The staff can only drop once a day, while the cloaks can drop every time you kill Ahune. Formula: Enchant Weapon - Deathfrost has a chance to be dropped by Ahune, every time you kill him. Note that the food buffs stack with raid buffs. In addition to all the items listed above, the event vendors also sell Handful of Summer Petals for 2 Burning Blossoms and Helm of the Fire Festival for 350 Burning Blossoms. The Midsummer Fire Festival is a good occasion to work on your guild reputation and to speed up your alts' leveling. Every time you honor or desecrate a bonfire, you complete a quest and get the same amount of experience and guild reputation that a quest of your level would normally give you. In addition, at each bonfire's location, there is also a ribbon pole which you can click. Doing so will give you Ribbon Dance, a buff that increases experience gained from killing monsters by 10%. The duration of the buff depends on how long you interact with the pole. The maximum duration is 60 minutes. The event features several quests. Two of them are introductory quests and serve to present the event. 3 of them are daily quests and they are enabled after completing pre-requisite quests. Commoners in every major city will give you the introductory quest of the event: The Master of Summer Lore (Alliance) or The Spinner of Summer Tales (Horde). They are to be turned in to a Festival Loremaster (Alliance) or Festival Talespinner (Horde), which can be found in capital cities of your faction. From the Festival Loremaster or Festival Talespinner, you can take Incense for the Summer Scorchlings (Alliance) or Incense for the Festival Scorchlings (Horde), for which you will need to deliver Summer Incense to a scorchling (small fire elemental) outside a settlement of your faction. While doing the event, you will encounter these NPCs very often, so there is no need to look for one specifically. Each of the two introductory quests rewards 1 Burning Blossom. More Torch Tossing (Alliance Horde) and More Torch Catching (Alliance / Horde) are given by Master Fire Eater (Alliance) or Master Flame Eater (Horde). Before the daily quests are offered to you, you must complete the two following pre-requisite quests, Torch Tossing (Alliance / Horde) and Torch Catching (Alliance / Horde), given by the same NPCs. Tossing torches consists in throwing Practice Torches (the quest item) to braziers at the nearby bonfire. One problem with this quest is that you need to hit the brazier that is currently marked and people with lag will find it extremely hard to hit the marked brazier in time. Catching torches consists in lighting Unlit Torches at the nearby bonfire before throwing them in the air. Then, you need to follow the torches' shadow so that you are properly positioned to catch them before they hit the ground. Avoid places with a dark ground (where shadows are hard to follow), a lot of aerial pollution (trees, flags, buildings, etc. can affect the position of the camera), or a lot of other players doing the same quest (you will have a hard time figuring out which shadow is that of your own torches). The pre-requisite quests and the daily quests reward 5 Burning Blossoms each. Note that Torch Catching (Alliance / Horde) will also reward you with 5 Juggling Torches, which you should save for the Torch Juggler achievement. These 3 quests take place in Ashenvale, so we advise you to do them while you are traveling through this area for honoring bonfires of your faction and desecrating those of the opposite faction. Level 64 to 90 — Striking Back: Glacial Templar near the Dark Portal in Hellfire Peninsula. Each of the possible daily quests rewards 10 Burning Blossoms. During the event, you will spend the majority of your time traveling through Azeroth to honor bonfires of your faction, to desecrate flames of the opposite faction, and to steal the flames in the opposite faction's capital cities. By doing so, you will earn all of the bonfires and flames achievements. The bonfires act as quest givers, so to honor or desecrate them, simply accept the quest given to you and it will be completed right away. The flames in capital cities are objects that you can interact with. Doing so will give you an item that starts a quest that you must turn in to a Festival Loremaster (Alliance) or Festival Talespinner (Horde) in one of your faction's capital cities. stealing a flame in a capital city: 25 Burning Blossoms. The Alliance has 50 bonfires and the Horde 48. In addition, there are 14 neutral bonfires. Finally, each of the four capital cities of the opposite faction has a flame that you can steal. This means that Horde players have a slight advantage over Alliance players when it comes to collecting Burning Blossoms. In total, the bonfires will bring 840 Burning Blossoms to Horde players and 830 to Alliance players. 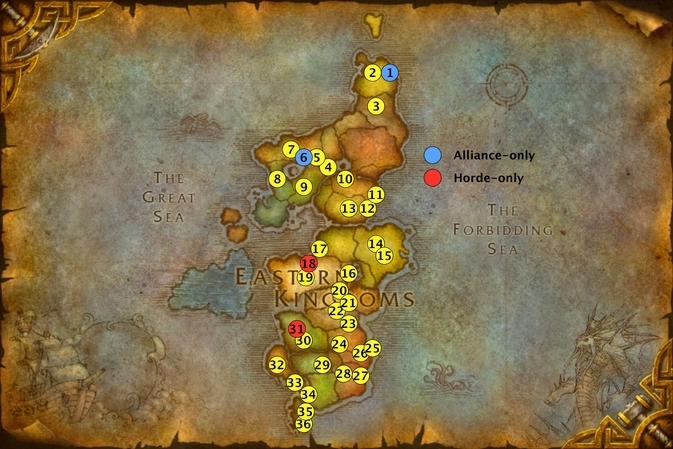 There are 32 bonfires in Eastern Kingdoms, 17 for the Alliance and 15 for the Horde. They will enable you to complete Extinguishing Eastern Kingdoms (Alliance / Horde), Flame Warden of Eastern Kingdoms (Alliance), and Flame Keeper of Eastern Kingdoms (Horde), as well as parts of Extinguishing the Catacysm (Alliance / Horde), Flame Warden of Cataclysm (Alliance), and Flame Keeper of Cataclysm (Horde). 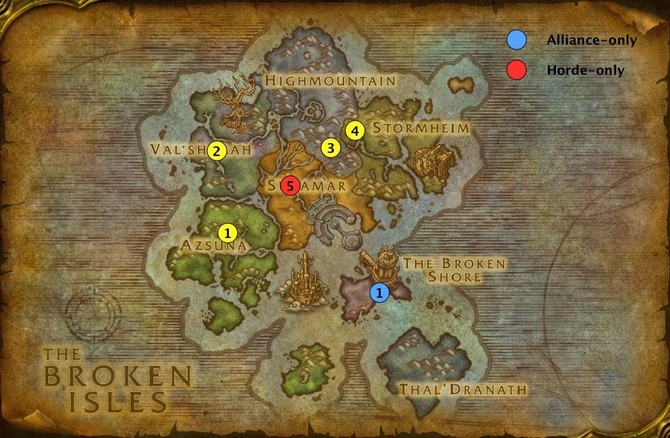 In the map below, Horde players should visit the bonfires in the order displayed while Alliance players should follow the reverse order. The order was designed with flying mounts in mind, so you might want to adapt it if you will be using Flight Paths. 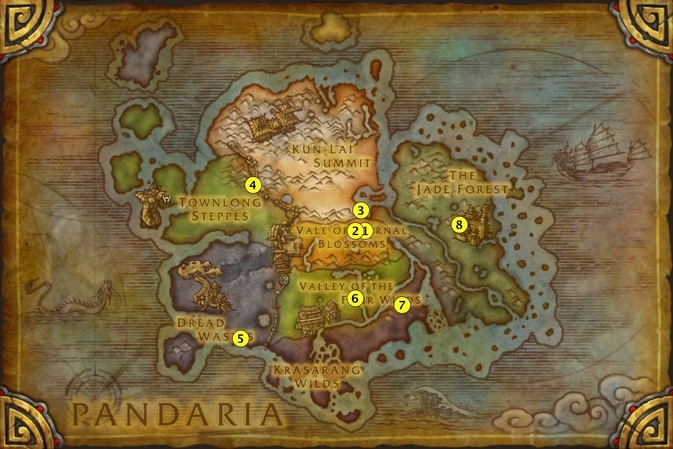 There are 31 bonfires in Kalimdor, 15 for the Alliance, 15 for the Horde, and 1 neutral bonfire in Hyjal. They will enable you to complete Extinguishing Kalimdor (Alliance / Horde), Flame Warden of Kalimdor (Alliance), and Flame Keeper of Kalimdor (Horde), as well as parts of Extinguishing the Catacysm (Alliance / Horde), Flame Warden of Cataclysm (Alliance), and Flame Keeper of Cataclysm (Horde). 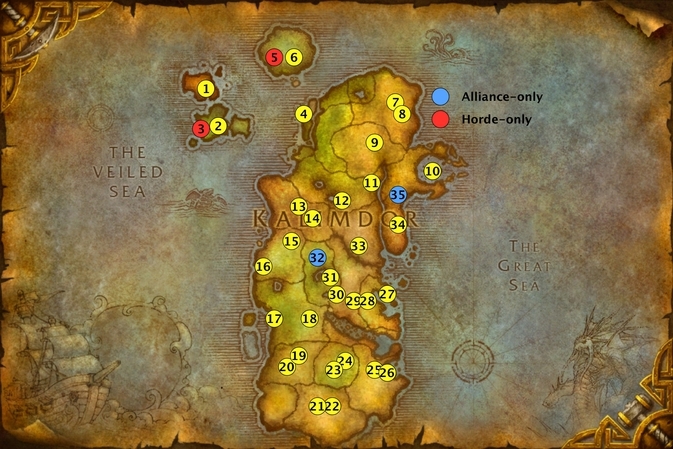 In the map below, Alliance players should visit the bonfires in the order displayed while Horde players should follow the reverse order. The order was designed with flying mounts in mind, so you might want to adapt it if you will be using Flight Paths. 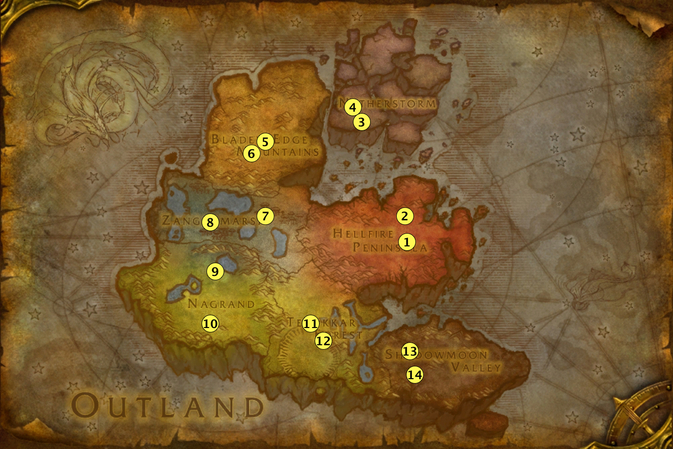 There are 14 bonfires in Outland, 7 for the Alliance, and 7 for the Horde. They will enable you to complete Extinguishing Outland (Alliance / Horde), Flame Warden of Outland (Alliance), and Flame Keeper of Outland (Horde). The bonfire order, in the map below, was designed with flying mounts in mind, so you might want to adapt it if you will be using Flight Paths. 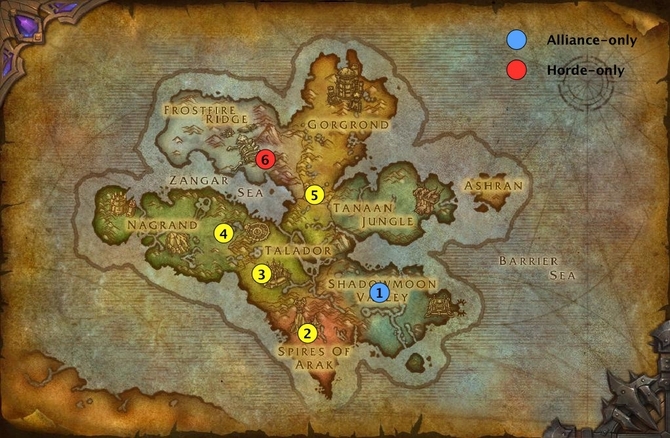 Note that if you start from Shattrath, you should do 11, 12, 14, and 13 first (and then go the Hellfire Peninsula). 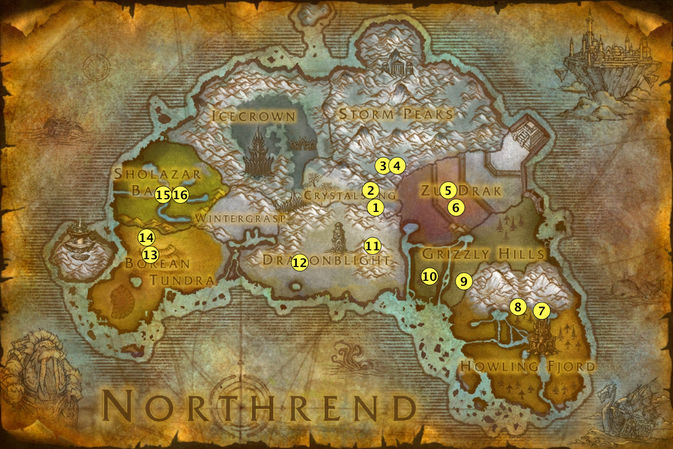 There are 16 bonfires in Northrend, 8 for the Alliance, and 8 for the Horde. They will enable you to complete Extinguishing Northrend (Alliance / Horde), Flame Warden of Northrend (Alliance), and Flame Keeper of Northrend (Horde). If you followed us up to this point, you only need to visit the neutral bonfires in Deepholm and Vashj'ir to complete Flame Warden of Cataclysm (Alliance) and Flame Keeper of Cataclysm (Horde). The bonfire in Deepholm is at the Temple of Earth. The bonfire in Vashj'ir is at the Silver Tide Hollow in the Shimmering Expanse. There are 8 bonfires in Pandaria. They will enable you to complete Extinguishing Pandaria (Alliance / Horde), Flame Warden of Pandaria (Alliance), and Flame Keeper of Pandaria (Horde). There are 6 bonfires in Draenor. They will enable you to complete Extinguishing Draenor (Alliance / Horde), Flame Warden of Draenor (Alliance), and Flame Keeper of Draenor (Horde). There are 6 bonfires in the Broken Isles. They will enable you to complete Extinguishing the Broken Isles (Alliance / Horde), Flame Warden of the Broken Isles (Alliance), and Flame Keeper of the Broken Isles (Horde). After stealing all four flames of the opposite faction (in their capital cities), you will be given the A Thief's Reward (Alliance / Horde) quest by the Festival Loremaster (Alliance) or Festival Talespinner (Horde) in any of the capital cities. This quest is completed immediately, causing you to receive a Crown of the Fire Festival, a nice-looking item that cannot be used for transmogrification, and to earn the King of the Fire Festival achievement. Ahune is the boss of the event. Only characters at level 89 and 90 will be able to access it by queuing for the boss in the Looking for Group tool. Once in the instance, walk until you reach the Earthen Ring representatives. Nearby, you will find an Ice Stone that you can click to summon Ahune. Phase 2: Ahune becomes attackable and your group should use DPS cooldowns to do as much damage on him as possible. Every time Phase 1 comes around, the number of elementals in each wave increases. This constitutes a soft enrage timer. be able to loot Shards of Ahune, an item that starts the Shards of Ahune quest, which rewards 20 Burning Blossoms and a unique tabard of your choice: Tabard of Summer Skies or Tabard of Summer Flames. has a chance to contain an Ice Chip (teaches how to summon a Frigid Frostling). Formula: Enchant Weapon - Deathfrost. If you followed this guide, then the only Midsummer Fire Festival achievements that you still have to complete are Burning Hot Pole Dance and Torch Juggler. For this achievement, you first need to buy a complete Midsummer set Mantle of the Fire Festival (100 Burning Blossoms), Vestment of Summer (100 Burning Blossoms), and Sandals of Summer (200 Burning Blossoms). So you need to spend 400 Burning Blossoms in total. Once you have acquired the set, equip it and find a ribbon pole. They are located near bonfires in major capital cities and settlements. Simply click the ribbon pole and let your character dance for a whole minute for the achievement to trigger. For this achievement, buy 10 Juggling Torches from a Midsummer Supplier (Alliance) or a Midsummer Merchant (Horde) in a capital city. 5 Juggling Torches cost 5 Burning Blossoms, so you will need to spend 10 Burning Blossoms. If you you kept the torches given to you when you completed Torch Catching (Alliance / Horde), then you will only need to buy 5 more. You do not need to buy 40 torches as you recover the torches if you use them properly (hence why it's called juggling). Once in possession of the torches, go to Dalaran. Bind the torches to a key and keep spamming it as well as your left mouse button (because you need to select where you send the torches and it has to be exactly on your character, so that you can juggle without having to move). We hope that this guide will have answered every question you had about the Midsummer Fire Festival. If not, we encourage you to leave a comment or contact us by e-mail, we will be happy to address the issue you encountered. 22 Jun. 2017: Updated for 2017. 21 Jun. 2016: Nothing changed from 2015. 22 Jun. 2015: Updated for 2015. Added new pet, toys, and Heirloom upgrades. 29 May 2014: Updated for 2014 (no changes). 22 Jun. 2013: All previously optional bonfires are now required for the achievements, so the maps were updated accordingly. 21 Jun. 2013: Added locations for Pandaria's bonfires. 20 Jun. 2013: Updated for 2013. Updated links to items from Ahune (they now have a level of 480). Updated mentions of 2012 and level 84/85. Added achievements for Pandaria (although we will need for the event to be live before adding the locations for the bonfires). Added gear from Ahune to the list of rewards at the beginning of the article.